Australian women are suffering from a crisis of confidence about work, captives to a voice inside their heads that says they’re not good enough. Accustomed to being overlooked and undervalued, even when women do get to the top, they explain their success away as ‘luck’. But it’s not. Not Just Lucky exposes the structural and cultural disadvantages that rob women of their confidence - often without them even realising it. It’s a practical toolkit that will help you negotiate a raise, deal with difficult bosses, overcome imposter syndrome, communicate more clearly, cope with failure, avoid burnout, call out sexism and finally put your hand up for that big promotion. This unashamedly feminist career manifesto is for women who worry they’ll look greedy if they ask for more money. It’s for women who feel small and scared. It’s for women who dream big but dread the tough conversations. It’s for women who get nervous, stressed and worried, and seem to overthink just about everything. It will help you realise that you’re not just lucky. You’re brilliant. Jamila Rizvi is by no means ‘just lucky’. She has forged a stellar career in federal politics and the media by using her formidable intelligence and working ridiculously hard. Of course, luck has played an important role, and she’s the first to acknowledge the impact of being born into the privilege of a comfortable middle-class upbringing. 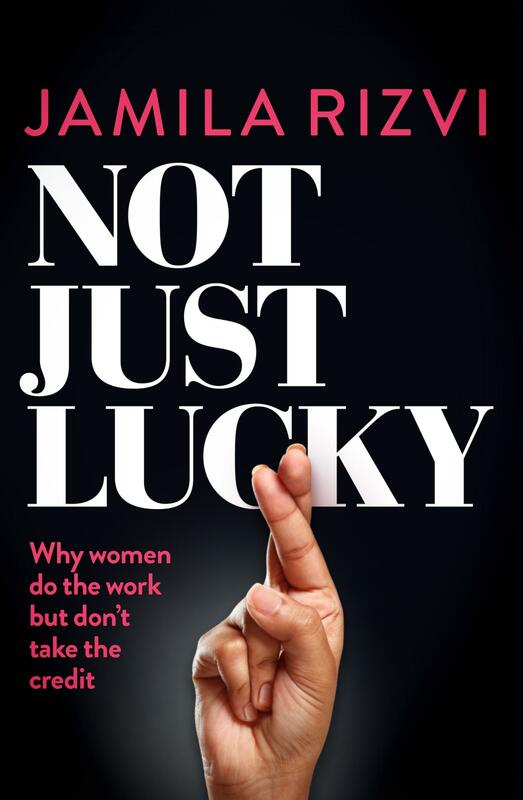 However, Rizvi argues that too often, women attribute their career success to luck, when really they’ve won their achievements by being talented and working hard. Rizvi’s ambition for her ‘feminist career manifesto’ is to change the way women who are just starting out in their careers approach their professional lives. Informal and highly readable in style, Not Just Lucky outlines with brutal clarity the disadvantages women continue to face in the workplace. Rizvi then provides practical tips on building confidence and overcoming the fear of failure. She is absolutely clear that this does not mean acting more like a man. Rather, she wants her readers to be aware of the ways they might be subtly undermining themselves in order to meet traditional masculine expectations. This is not a book about changing the system, but rather a toolkit for survival within it. While Rizvi doesn’t specifically critique capitalism, she points out that traditional workplaces are built for men and that large, male-dominated corporations control the majority of wealth. Refreshingly, she also writes about the importance of unionisation and solidarity: concepts that often get lost in a type of modern, hollow feminism that focuses on the individual over the collective. This book is for young professionals, rather than working women in other types of paid or unpaid work – but Rizvi does not pretend otherwise. Crucially, her chapter on the importance of mentoring is not simply about how to find someone to help you climb the career ladder, but emphasises the importance of being a mentor at any stage in your career, reaching out to other women who may not be in as privileged a position.